I am absolutely blown away by the things that are available these days. Sometimes, I am intrigued by the technology, but at the same time, frightened by the implications. Are we really destined to become a cashless society? A new company, called Square is turning the credit card processing industry on its ear with an application available at the iTunes store. 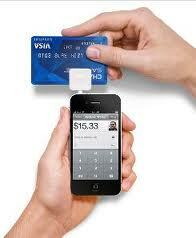 Available for the iPad, the iPhone and iPod Touch, Square enables you to take credit card payments for, well, just about anything. Once you register for the free Square app they will send you a card reader that plugs into your mobile device and then, let the swiping begin. With no contracts or monthly fees. Receipts are sent electronically and you can track your sales all in one place. Transaction fees are settled nightly, instead of monthly and it’s available for use by anyone that would like to be able to take credit cards, not just businesses. Now I cant help but ponder how this nifty little program is going to be used, and I’m not certain it’s all going to be good, but the one thing I am sure of is that my next garage sale is going to be a whole lot different than it was before. Anyone want to buy a couch? « Instant Messaging: Is it good for my library?